Irma's Field Notebook: Happy Thanksgiving! Work was a bit slow this week. We finished up some work on the building 155 renovations: installing light fixtures, receptacles, etc. 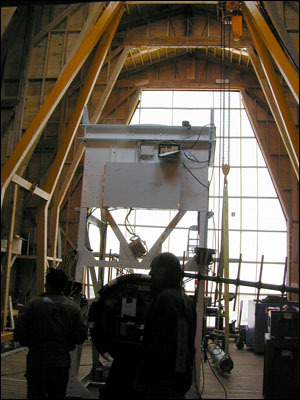 It is difficult to do so much renovation on a building that is so constantly in use. Different parts are scheduled to be worked on at different times, and I don't think that the entire project is due to finish until next year sometime. They are going to redo the whole galley section, but cannot do it until winter when the number of people on station drops from 1200 to around 200. If I come back next season it will be interesting to see the changes that will have been made. We also had to go out to Willy Field and dig up the aircraft landing lights in preparation for moving the runway. They do not put away all the lights from year to year. They are just left out there. We have to go dig them out because they are covered in a year's worth of snow and ice. We dig them out, fill in the hole and reset them all. Most of them were only down about 3 feet, but the two that mark the beginning of the runway never got taken up the year before. We dug down almost 10 feet and never could find the bottom. So we had some brackets made to just extend the supports up a few feet. Next year they are going to have to add more cable as the power feeds are now so deep in the ice. Even though this is a permanent ice shelf, it is constantly moving. First of all, it is at the mouth of a glacier so it is constantly being pushed out to sea. The tides continually move the ice as well. 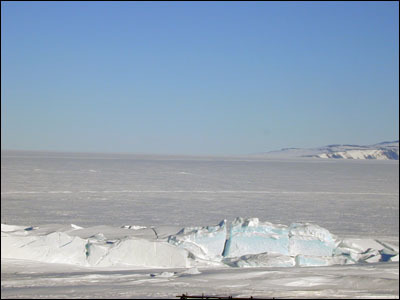 The ice shelf is 160–300 feet thick over water that is more than 1500 feet deep. 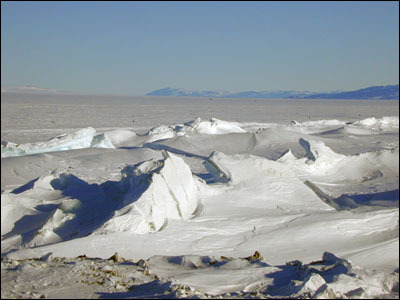 The average tide change is about 15 feet, and the ice shelf is constantly moving up and down. It causes huge pressure ridges at the edges. Of course if you are out on the ice shelf, the movement is imperceptible. It never melts and is thick enough that there are permanent buildings out there. It will also support a good–sized airport. We are scheduled to move the airport next Friday. It should be an interesting endeavor. 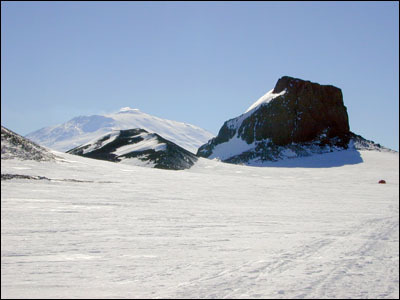 There are several scientific expeditions that are based out there. Many of the people working there live in jamesways or tents out in the field. 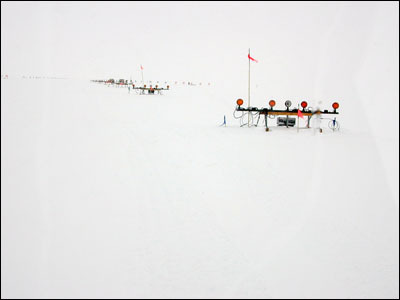 One of the expeditions is SOAR (Sub Office of Aerogeophysical Research). They do a lot of the aerial mapping of Antarctica and their planes are located there. I don't know too many of their employees. There is also a galley. It is the best place I've eaten since I've been here. They have good cooks and they do a great job. Anyway, while we were out there having lunch we met some of the people working with the National Scientific Balloon Facility. They send a huge balloon up into the upper atmosphere. The balloon is about the size of 2 football fields and will carry a payload of experiments. There are two balloons with two payloads this year and they plan to launch the first in a week or two depending on weather. There are circumpolar, or cyclonic winds high above the earth. These winds rotate in one	direction in the summer months and in the opposite direction in	the winter months. When the balloon is sent up it will catch those winds around 25 miles above the earth. 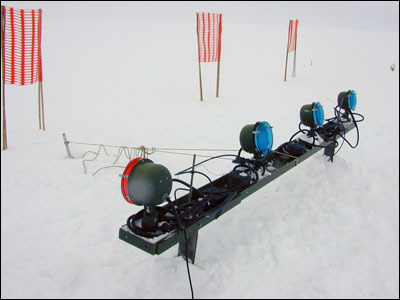 The balloon will then follow the currents in a circle around the continent, i.e., the pole, and return somewhere near the original launch site. 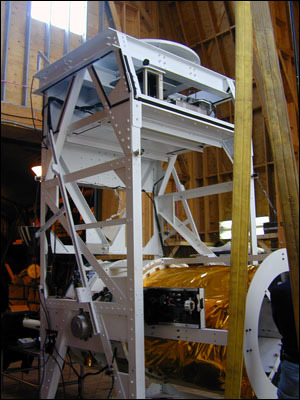 One of the experiments it will carry is a huge solar telescope that will study solar flares, the Flare Genesis Project. After lunch they took us over to the storage facility and showed us the telescope and equipment. It was all very interesting. We have also been invited out to watch the launch in a week or so. It should be exciting. We celebrated Thanksgiving on Saturday rather than Thursday (that's Friday for you folks back home). That way we got two days off in a row rather than two different days. They had 4 dinner seatings for Thanksgiving dinner, beginning at 3 P.M. I had dinner with my roommate Rebecca and some friends from the Cape Roberts Project, and we took the last dinner seating at 6 P.M. The galley people really outdid themselves. They decorated the galley and cooked a delicious meal. There was roast turkey, smoked turkey, Antarctic cod (food of the Gods), two kinds of stuffing, several vegetables, fresh breads, and many deserts. It was really rather nice. That Saturday had to be the most perfect weather I have seen since I got here. It was probably +20–25°F outside, but without a single breath of wind. There was not a cloud in the sky. It was such a beautiful day. My friend Patrick and I decided to hike up to Castle Rock. 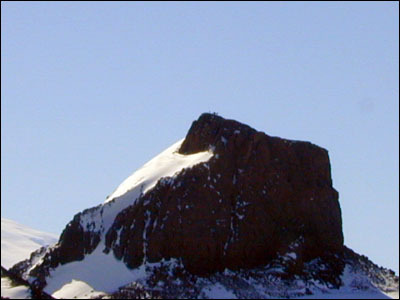 Castle Rock is a fairly good–sized crag (about 1300 feet) several miles from town. Anytime you go on a hike like that you have to check out at the firehouse and leave a plan of where you are going, who and how many in the party and what time you are expected to return. That way if there are any problems (unexpected weather changes, accidents, etc. ), and you do not check back in, they will send a search a rescue team out to look for you. They take all of that very seriously. 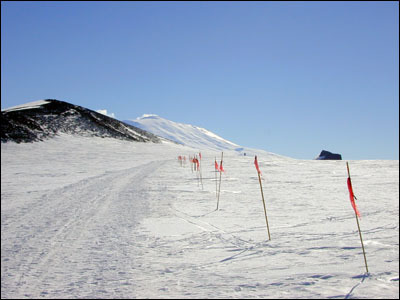 The route is flagged so that you don't accidentally wander off in the wrong direction and fall into a crevasse. 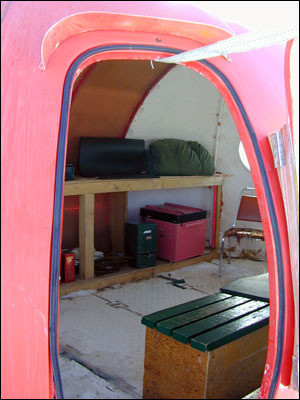 Also, every mile along the way is a shelter in case the weather turns bad. 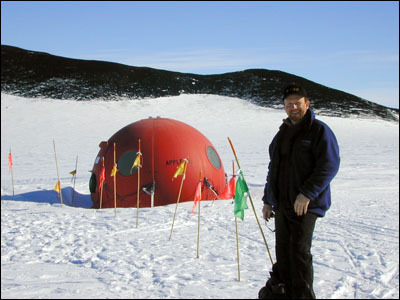 These are funny little round structures which are fairly well insulated and stocked with basic survival gear. They are all bright red and called "tomatoes." We made it to Castle Rock but didn't climb it as Patrick was scheduled to go to the 3 P.M. dinner and we were running out of time. Still, it was a beautiful walk on an absolutely perfect day. Really nice. I didn't have to wear all of my ECW gear as the weather was so nice, but we always have to take it with us. It is really quite a chore getting dressed around this place. If you know you are going to be working outside you need to wear all of the ECW gear. You begin with the expedition weight thermal underwear. That alone is pretty cozy. On top of that you wear a fleece layer (pants and top). Then comes the windproof layer which consists of a pair of overalls and a jacket. This is a thin layer of nylon which really stops the wind from cutting through. On top of that are Carhartt overalls and a Carhartt coat with fur trim. On your feet you wear a pair of thick wool socks, topped with a quilted bootie. Our boots are very large and well–insulated blue boots (they look like Frankenstein boots). It feels like I am wearing weights on my feet, but my toes have NEVER been cold. On your hands you wear wool glove liners, leather gloves and on top of those are huge mittens which come almost up to your elbow with a fleece backing. On your head you wear a balaclava which completely covers your head except for your eyes, nose and mouth. You also wear a neck gaiter which you can pull up over your nose and mouth. You can wear sunglasses, but if it's really cold we have goggles which, combined with the other pieces, covers all the skin on your face. On your head there is a Yazoo cap with ears. I will say, however, that with all of these clothes on you really don't get cold. It is amazing. And while it is more difficult than usual to move, you are still quite flexible, all things considered. However, as the weather improves we are wearing fewer and fewer layers. If I am only going to be outside for short periods of time I will only wear blue jeans, a t–shirt and a fleece or wind jacket. And if I am just going between buildings there have been some days already that I can go outside in short sleeves and have it actually feel good. Amazing, isn't it? I am told that by New Years we should all be outside in summer clothes. We'll see!